If there’s a Google service that’s ripe for the grave, Google Voice certainly was a strong contender. The telephony service hadn’t seen many improvements or major features in the past three years or more. But Google has now pushed Voice back into the limelight via an update that introduces a major visual overhaul, along with some additional features. The update is largely visual. The web, Android, and iOS app now employ Material Design — guidelines from Google that offer structure and flow based on natural movement and interaction. The company has gradually been redesigning all of its services to fit the style. The new Google Voice app is markedly different from the previous version, which was still using design themes of Android 4.2 Jelly Bean. There are three main tabs (on the iOS app, the fourth tab is a dialer): texts, calls, and voicemail. These are now clearly separated and easy to access. The other big improvement in the update is how Google has added support for group and photo MMS, as well as the ability to quick reply from the notification. Previously, group messages showed up separately from individuals, and it was almost impossible to respond to a whole group as well. The company is also adding voicemail transcriptions for Spanish. That’s really all there is in the update but it’s a welcome sign for Voice users, especially since Google is now promising to “provide regular updates and features” for the service. 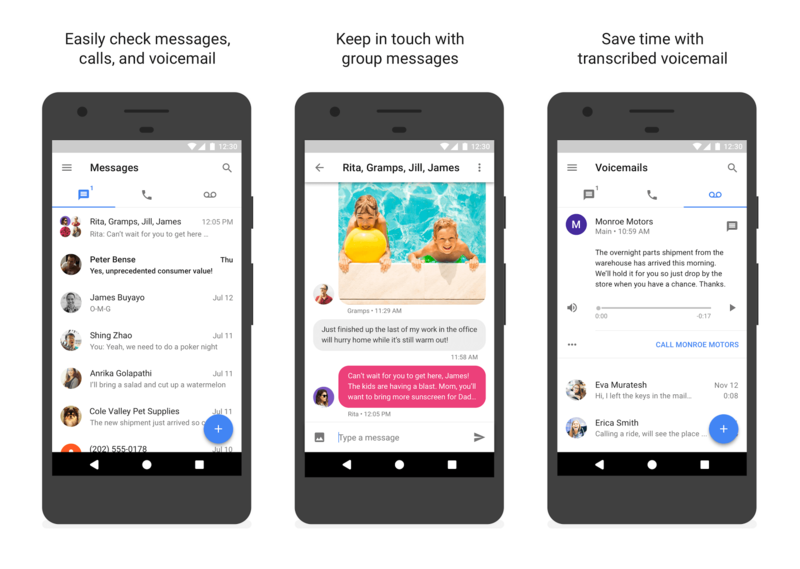 Many of Google Voice’s features merged into Hangouts, the company’s messaging platform. It’s clear that the reason Voice is getting a makeover is due to Google positioning Hangouts away from consumers and instead, shifting it toward the enterprise market. It’s still unclear why these features weren’t simply added into Google Messenger, the company’s primary texting application. The new redesign is gradually rolling out, so you may not see it for a few weeks.